Phil Dowd is, I reckon, one of the better referees in the premier league. Watching the match yesterday, I originally thought that he gave some very generous decisions in Chelsea’s favour, I still think that but I now realise he gave at least one goal to United that was offside. Yesterdays match was probably the most bizzarre I’ve ever seen between two top teams. 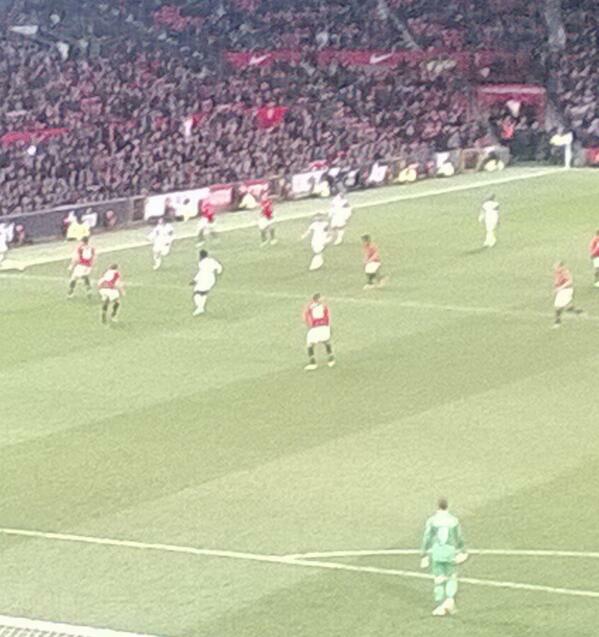 United’s usual precision of passing was lacking and there was some very sloppy play from Uniteds midfield. Couple that with some very unusual waste’s of good opportunity from Chelsea, Ramires and Fernando Torres in particular (in fact Torres, more infamous) meant that this was as far from the usual keep it tight game that United and Chelsea usually serve, as can be. It was a great help to United that Chelsea insist on having a clearly past-it John Terry as skipper and first choice centre half. Whilst Chris Smalling was fractionally offside for United’s first goal, Chelsea’s marking was diabolical. It wasn’t as if Smalling was offside through a well marshalled Chelsea defence but by a shambolic and incoherent back four which left John Terry on his own, tracking back. By thirty minutes, Chelsea had spurned three great goal scoring oportunities from Torres and Ramires, but that was to get much better later. Nani scored a belter to make it 2-0, he cut through the Chelsea defence like a hot knife through butter to hit, from twenty yards, a screamer which went flying past Petr Cech’s right hand side. Phil Jones was immense yesterday, he has made a massive impression on everybody at Old Trafford since his debut. Most people, myself included were pretty ignorant of him until he came to Old Trafford but now, he looks like such an imposing figure and for such a big lad, surprisingly nimble footed. He dosen’t as much dance and skip his way through a defence, like Nani, as he just goes through them like a light footed tank. It’s hard to believe he’s only nineteen years old. After the recent anihilation of Arsenal, the Stretford end serenaded Chelsea with Are you Arsenal in disguise ? Chelsea, who had in Ashley Cole one ex Arsenal player decided to answer that by bringing on another ex Arsenal player at half time in Nicholas Anelka. It took him all of thirty seconds to make an impact by threading a brilliant pass through to Torres who dinked the ball over De Gea to make it 3-1. United’s counter attacking play can be devastating. Juan Mata had a shot on Uniteds goal which was brilliantly saved by David De Gea, Chelsea took a short corner, lost possession and within ten seconds, United had hit the bar through Nani and then won a penalty. Wayne Rooney took the penalty and his standing foot slipped just like David Beckham in Turkey in 2003 and also more celebrated by United fans, John Terry in Moscow in 2008. Torres missed three great chances yesterday but the one that everybody will remember and the one that’ll have Ronnie Rosenthal doing cartwheels in gratitude, is the open goal miss in front a disbelieving & delirious Stretford End with five minutes to go. As Torres controlled the ball and rounds De Gea like the top class centre forward we know he is, I’m mentally preparing for 3-2 and a late siege on United’s goal. The crowds reactions was like none I’ve witnessed in my thirty years of watching football. Relief, derision and the sound of scornful laughter from at least 73000 people. Even the Chelsea fans in the L stand behind me were laughing, though in a more rueful and resigned manner than we were. Chelseas heart, unsurprisingly vanished after the Torres miss, so much so that a bad miss by Dimitar Berbatov in the last minute will be, by most people, forgotten.